We are now taking orders for Namco's latest driving machine release, Wangan Midnight Maximum Tune 3 DX Plus. Production of the complete machines is strictly limited and orders are being filled on a first come first served basis for March 2010 delivery. Maximum Tune 3 DX Plus features two new car models (the Nissan Skyline GTR and Nissan GTR), one extra course (the Fukuoka Urban Express Way) and many new dress up parts for players to further customize their vehicles. 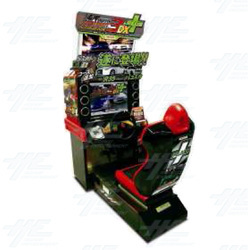 The machines are English version and ship complete with all machine artwork, including poster, POP, and stickers for seatback, side panel and signboard. Please note that orders for this product will close on November 20, 2009. No orders will be taken after this date. Maximum Tune 3 DX Plus is also available as an upgrade kit. For pricing and more information please contact our sales team.